Warm up from the chilly weather with this hearty dish. Kale is a rich source of carotenoids, making it an excellent choice for preventing diseases including cancer. 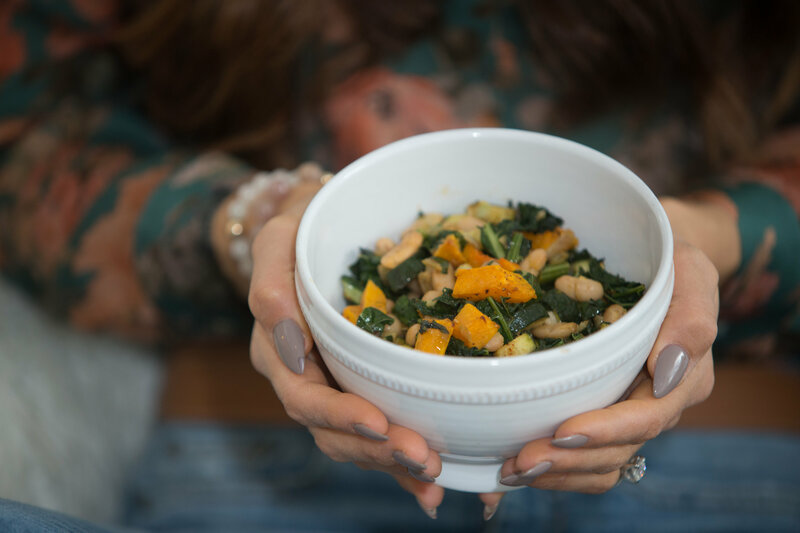 Kale is also a rich source of calcium and vitamin C. Combined with butternut squash and white beans, this is the perfect vegetarian option for a satisfying lunch or dinner that is also high in protein! Begin by peeling and chopping the butternut squash into small cubes. Toss in one tsp of olive oil and salt and pepper. Spread cubes on a baking sheet. Bake for 20 minutes at 420° F.
Next, place one tsp of olive oil into a pan and add the onion and garlic to medium-low heat. Cook until lightly golden. Add the zucchini and kale. When the squash is cooked, add it to the pan along with the beans and all the seasonings. Cook for another few minutes and then turn off the heat. Enjoy warm.